Cédric Bouchard is one of the leaders of the new wave in Champagne. He comes from a Champagne family - his father is an old school grower, but Cédric does things differently. All of his wines are single vineyard, single vintage wines, and as Peter Liem write on ChampagneGuide.net, "Bouchard doesn’t use any wood for his champagnes, preferring to ferment all of his wines in stainless or enameled steel...This sensibility corresponds to the rest of the winemaking, which seeks to present the wines in the clearest possible manner: no chaptalization, no fining, no filtering, no cold-stabilization and no dosage. The wines go through a natural malolactic and are racked only once, just before bottling." There is another aspect to Bouchard's wines that I find particularly interesting. He wants to make wine, and he happens to be doing this in Champagne. So the wines have bubbles, but they are very small and fine, and Bouchard actually bottles at lower pressure (4.5 bars as opposed to 6) to minimize their impact. I think that Champagne in general is underrated as a companion for food, but because of this low pressure bottling, among other reasons, Cédric Bouchard's wines should be particularly good. Jaime set a lovely table and made a great meal. He said maybe 28 words all night, and they were all worthy of careful attention. The other night I had the chance to test this theory. 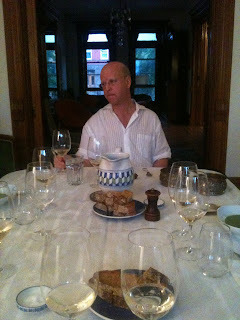 Jaime Wolff, one of the owners of Chambers Street Wines, hosted a dinner in which we drank through the entire current lineup of Bouchard's wines, and paired them with his great cooking. As a whole, the wines showed fantastically well, just an excellent group of wines. I hadn't drunk a Bouchard wine in almost a year and it was great to see that they are even better than I remember them to be. These are wines of intense flavors, and they express themselves with great clarity and finesse. They take time to open up, and Peter Liem says that they do well with decanting, particularly the Roses de Jeanne wines. 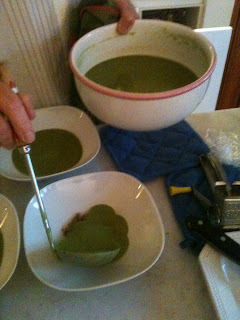 We started with Jaime's delicious pea soup, which he ladled over a little mound of sauteed mushrooms. 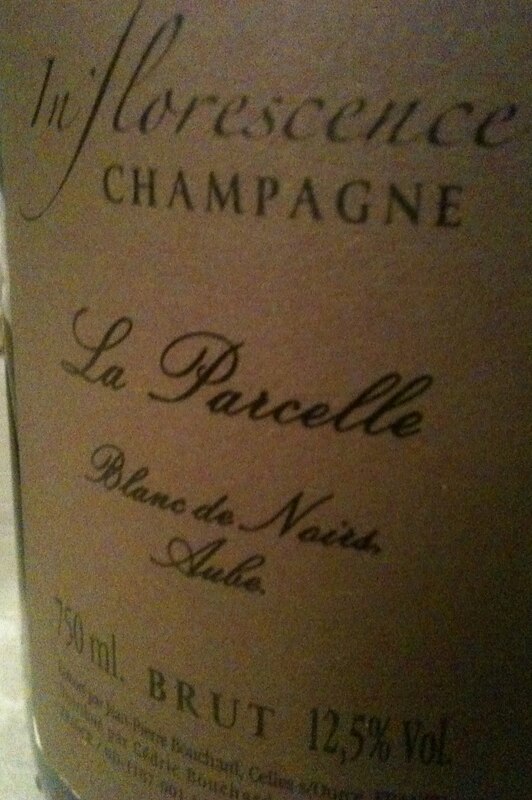 With this we drank two different Inflorescence Brut Blanc de Noirs, the 2008 and 2009. Both were excellent wines, approachable in their youth, and both grew in depth over the course of their first hour open. I preferred the 2008 with its rich, resonant fruit and complex depth, its baseline of minerality. It hit a harmonious highpoint after a little over an hour and really is a great value at about $55. The 2009 was lovely too, much more floral and high toned in aroma, more lithe in body, and with a saltier sense to the minerality. The 09 might be more of a wine to drink young, and the 2008 seems to be a great candidate for the cellar. Jaime then served a squash risotto which which we paired with the 2004 Inflorescence Brut Blanc de Noirs La Parcelle. This is the first version of La Parcelle that was made by Cédric Bouchard - he bought the vineyard from an old family friend and and also bought some of the Champagne stock, selling it under the Inflorescence label. This wine showed very leesy when first opened, somewhat constricted, its bright fruit flavors tightly coiled. 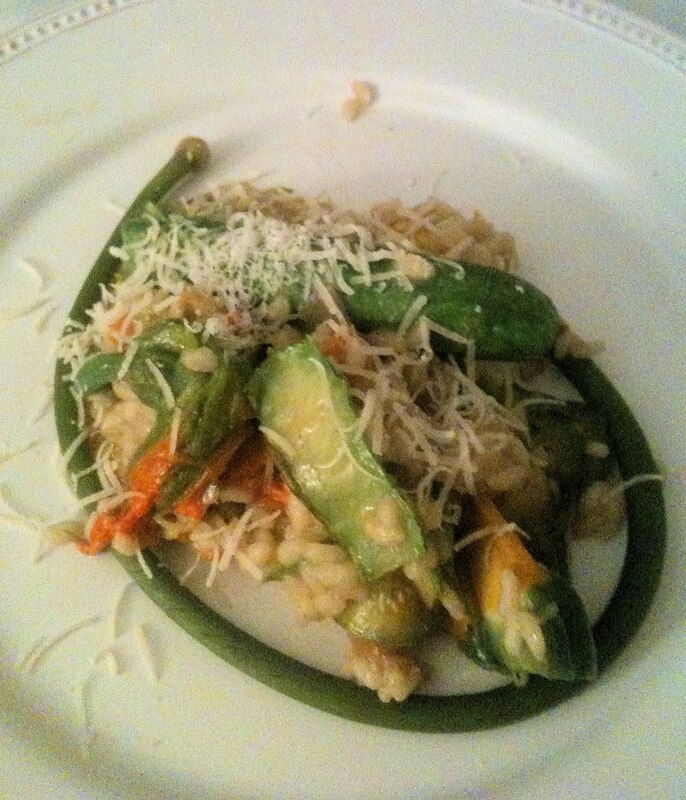 After some time it did open up a bit and the risotto dish brought out a savory element. The wine took on more focus with time and although the bright red fruit flavors were delicious, I think this it needs more time in the bottle. It retails for about $85. As La Parcelle opened up, we decided that this would be a good time to open a magnum of 2008 Roses de Jeanne Blanc de Noirs Les Ursulles, a very exciting event indeed. Roses de Jeanne is Cédric Bouchard's baby - unlike the Inflorescence wines, he owns the vineyards, and these are generally considered to be his top wines. Let me first say that it is not a joke, what they say about Champagne out of magnum. It really does show beautifully, so expansive, so expressive. Perhaps it's also simply the excellent quality of this particular wine - it is fantastic. Deeper gold in color than any of the previous Blancs de Noir, the fruit character is also different, more clearly Pinot than the others and at the same time redolent of pear and quince fruit, atypical flavors for Pinot. 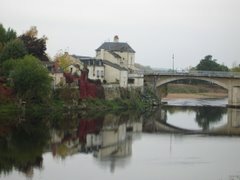 But this is the Aube, after all, and the warmer climate in this excellent vintage brings unusual nuance to Pinot wines. I loved this wine, perhaps more than the other tasters, but I thought it was a complete wine, perfectly structured, absolutely harmonious, incredibly intense and also focused and without any excess weight. I don't know what a magnum would retail for, but a 750 ml bottle sells for about $85 and is a great way to spend your vintage Champagne dollars. 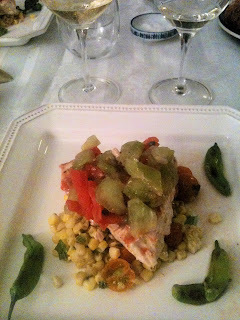 Jaime served grilled swordfish atop corn succotash and topped with peeled heirloom tomatoes. In what I thought was a genius twist, on this very hot August evening, he served the fish cool. Yes, it was grilled, and then cooled, and it was juicy and delicious. With this dish we drank Bouchard's wines made from white grapes, the 2007 Roses de Jeanne Blanc de Blancs La Haute-Lemblé and the 2007 Roses de Jeanne Blanc de Blancs La Bolorée. La Haute-Lemblé is Chardonnay from a warm south facing vineyard. I drank a bottle a little over a year ago and it took a very long time to open up, and it's probably too young to show its best now. Still, it was delicious and very fine wine. 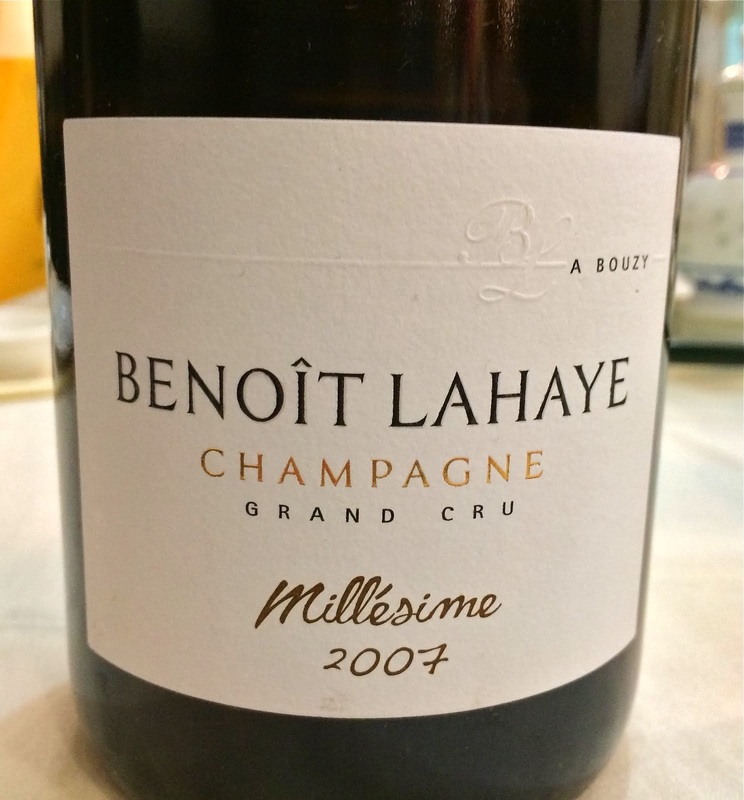 After the richly fruited Pinot Champagnes, this wine didn't seem to have fruit to spare, and yet it possessed the same exquisite structure, fineness of texture, and perfect clarity as the wines that preceded it, and it worked beautifully the swordfish with ripe corn and tomatoes. La Haute-Lemblé retails for about $100. We ended our evening with a wine that is very special, even in within the context of these special wines. 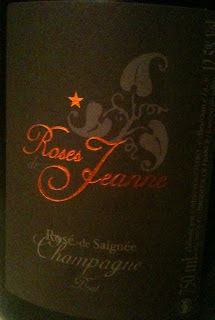 We drank the 2007 Roses de Jeanne Le Creux d’Enfer Rosé, a saignée rosé that is made entirely of Pinot Noir in only the best vintages. There are only three rows of Pinot in the vineyard and production is tiny and the wine is very expensive - more than $200 a bottle, if you can find it, which is highly unlikely. There are maybe a couple of cases in all of NYC and this has already become the kind of cult wine that typically never actually hits the shelves. We drank the wine with a lovely dessert of fresh berries and vanilla ganache, which turned out to be a mismatch. The wine is not so much about fruit, which is a strange thing to say about a saignée rosé. There is some fruit here, but the wine is a study in savory aromas and flavors, with underlying bitter notes, almost like you'd find in Campari. The complexity and depth really was somewhat astounding, and I cannot give better descriptions of the smells and tastes because they truly were so varied. 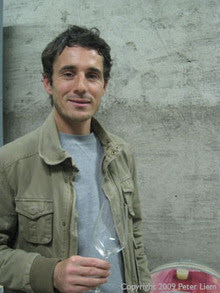 Photo of Cédric Bouchard courtesy of Peter Liem at ChampagneGuide.net. Jaime suggested that the wine would pair well with rare roast beef, and that is something that I sincerely hope to try one day. Someone else suggested a salad of beets, bitter greens, and goat cheese. In the following days I found myself thinking about really good ham with this wine. In any case, this and the other wines were great with the various dishes we ate, and I would say that they are most certainly wines for the table, in the case of the Roses de Jeanne wines, perhaps better as table wines than as apertifs. 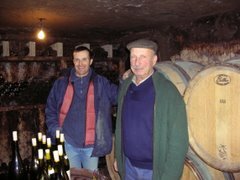 Cédric Bouchard's wines are very special and well worth a special search. Consider decanting them if drinking them young, and drink them with your dinner. Jealous beyond words. Glad they showed well--seems like a multitude of expressions. all I can say is some guys have all the luck! I love your way of desribing the 2007 Le Creux d’Enfer Rosé... To me it confirms that Cédric Bouchard is very hard to "fit in" to the "normality" of an aroma wheel, when you write tasting notes. He has his own universe. Thanks for your excellent posts. I know both Peter and Cedric. Knew Peter an excellent writer and taster but didn;t know about his cooking skills - might have to invite myself to dinner in Epernay some time. 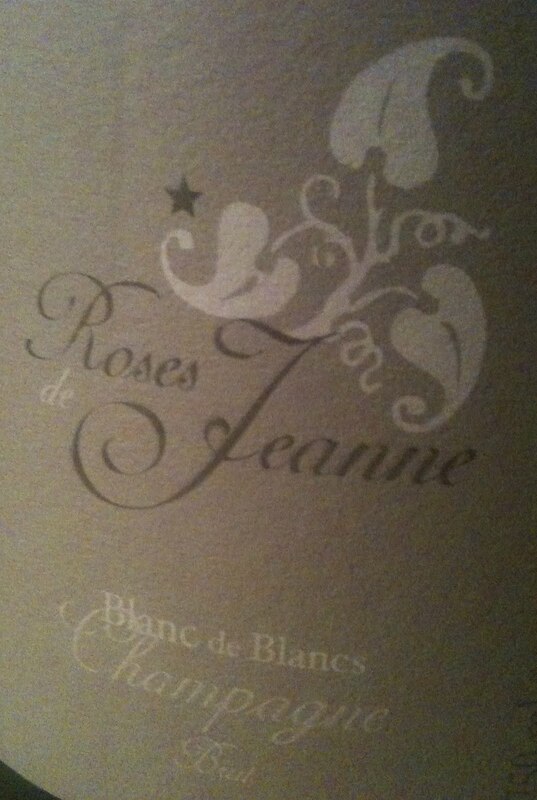 I love the Roses de Jeanne wines and import them into Australia. My great food match experiences with the Creux d'Enfer have been top quality Jamon Iberico in Barcelona and BBQ unagi ( Japanese smoked eel).